Sheraton Tribeca New York Hotel New York City, Hotel null. Limited Time Offer! Sheraton Tribeca New York Hotel. 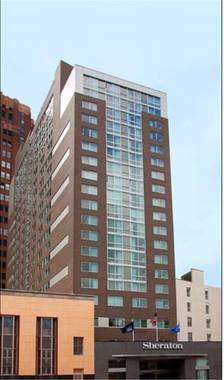 "Sheraton Tribeca New York Hotel" is a hotel that has obtained 4 stars. This hotel is an excellent base from which guests can discover New York. The accommodation consists of 369 modern rooms in total. Warm weather is kept outside thanks to the relieving air conditioning. Yoga and pilates are some of the recreational activities this hotel offers. Furthermore, there is a gym where visitors have the option to work out on their own. Visitors can sign in for a massage. Dinner can be enjoyed at the onsite restaurant which proudly serves its American specialty. After dinner, guests can enjoy a drink at the lounge bar. After a good night's rest, visitors have the option to enjoy the hotel's breakfast. If you would like to share your experiences instantly, there is Internet access available.